Microsoft released security updates for Microsoft Windows, Microsoft Office, and other company products on the November 2017 Patch Day. This guide provides end users and system administrators with information on all security and non-security updates, and security advisories that Microsoft released since the October 2017 Patch Day. It offers an Excel spreadsheet that lists all security updates released for Microsoft products, information on operating system distribution, download information, and other information related to the updates. Microsoft released security updates for all supported versions of Windows (client and server), and Internet Explorer, Microsoft Edge, Microsoft Office, .Net Core and ASP.NET Core, and Chakra Core. No critical updates for Windows, but for IE 11 and Microsoft Edge. Windows Server 2012 and 2012 R2: 11 vulnerabilities of which 11 are rated important. KB4048961 -- Windows 8.1 and Server 2012 R2 Security-only Rollup. KB4048958 -- Windows 8.1 and Server 2012 R2 Monthly Rollup. Addressed issue that caused SharePoint Online sites to stop working in Internet Explorer. And security updates that are part of KB4048961. Answers thread “Missing apps after installing Windows 10 Fall Creators Update”. Microsoft will release and document an additional solution in a future release. Addressed issue where access to the Trusted Platform Module (TPM) for administrative operations wasn't restricted to administrative users. Plus items 1, 4 and 5 of KB4048953. Addressed issue where roaming user profile–enabled accounts intermittently synchronize the appdata\local and \locallow folders with the profile server. Side effects include increased profile size, which can result in logon failures when there is full disk usage. Other symptoms include increased network bandwidth and logon or logoff delays on domain-joined computers. Addressed issue where access to the Trusted Platform Module (TPM) for administrative operations isn't restricted to administrative users. Addressed issue where, during BitLocker decryption or encryption of a drive, files protected with the Encrypting File System (EFS) may become corrupted. Security updates to Internet Explorer, Microsoft Scripting Engine, Microsoft Edge, Windows kernel, Windows kernel-mode drivers, Microsoft Graphics Component, Microsoft Windows Search Component, and Windows Media Player. After installing KB4041693 or KB4041691, error dialogs may be shown that indicate exceptions during the closing of applications. Solution: Microsoft is working on a fix. After installing KB4048957, KB4048961, KB4048958, KB4048960, KB4048953 updates, Internet Explorer 11 users who use SQL Server Reporting Services may not be able to scroll through drop down menus using the scroll bar. Solution: Press F12, select Emulation, change the Document mode to 10. Installing KB4048954 may change Czech and Arabic languages to English for Edge and other apps. Addressed issue where after installing KB4038788, some Microsoft Surface Laptops boot to a black screen. Additionally, you must press the power button for a long time to recover. KB4052231 -- November 2, 2017—KB4052231 (OS Build 14393.1797) for Windows 10 Version 1607 and Windows Server 2016. Addressed issue where Personal Identity Verification (PIV) smart card PINs are not cached on a per-application basis. This causes users to see the PIN prompt multiple times in a short time period. Normally, the PIN prompt only displays once. Updated the SPN and UPN uniqueness feature to work within the forest root tree and across other trees in the forest. The updated NTDSAI.DLL won't allow a subtree to add an SPN or a UPN as a duplicate across the entire forest. Addressed issue where the working directory of RemoteApps on Server 2016 is set to %windir%\System32 regardless of the application's directory. Addressed issue where the ServerSecurityDescriptor registry value doesn't migrate when you upgrade to Windows 10 1607. As a result, users might not be able to add a printer using the Citrix Print Manager service. Additionally, they might not be able to print to a client redirected printer, a Citrix universal print driver, or a network printer driver using the Citrix universal print driver. Added support for LTO8 tape drives into ltotape.sys for Windows Server 2016. The File may have been changed by another user. When you use Excel embedded in a previewer application (such as Windows Explorer preview pane), the worksheet in the preview window becomes unresponsive after you switch the focus away and then back. When you edit cells in Excel 2016 on a high DPI display device, Excel freezes. Cross-workbook formulas that are used as a source for a PivotTable cause Excel to crash. PivotTables that are connected to OLAP cubes and they contain multiple currencies but display only one of the currency symbols. When you open certain files that are created in earlier version of Excel, Excel crashes. When you delete a PivotTable and then undo the operation in Excel crashes. When you refresh a PivotTable in Excel 2016, more memory is consumed until all available memory is consumed. You can't import SharePoint lists to obtain values for the calculated columns in the SharePoint list. The Connection Properties dialog box can't be closed in certain workbooks. Correct the translation of the TRIM function in the Dutch version of Excel 2016. Some trusted local macros can't run if the BlockContentExecutionFromInternet security setting is enabled. KB4011262 -- Office 2016: Security update for Office 2016 -- This security update resolves vulnerabilities in Microsoft Office that could allow remote code execution if a user opens a specially crafted Office file. KB4011242 -- Office 2016: Security update for Word 2016 -- This security update resolves vulnerabilities in Microsoft Office that could allow remote code execution if a user opens a specially crafted Office file. When you close a document that is created by a template (.DOTM) in Word 2016, Word 2016 may crash. The footnote number in an Arabic document is displayed in Basic Latin instead of as an Arabic number. When you open certain .doc files in Word 2016, Word may crash. Improve performance in transforming text and styles programmability. When you use Microsoft Excel embedded in a previewer application (such as Windows Explorer preview pane), the worksheet in the preview window becomes unresponsive after you switch the focus away and then back. Calculated column value is not imported from an external data source. This connection name is already in use. Try a different name. Correct the translation of the TRIM function in the Dutch version of Excel 2013. When you undo some operations that involve multiple selected regions in Excel 2013, formulas may not be restored. KB3162047 -- Office 2013: Security update for Office 2013 -- This security update resolves vulnerabilities in Microsoft Office that could allow remote code execution if a user opens a specially crafted Office file. KB4011250 -- Office 2013: Security update for Word 2013 -- This security update resolves vulnerabilities in Microsoft Office that could allow remote code execution if a user opens a specially crafted Office file. Microsoft publishes security updates via its Windows Updates service and other services (many of them available to Enterprise customers only). Windows systems are configured to download and install important updates by default. The operating system checks regularly, but not in real-time, for updates. Use the Windows-key to bring up the Start Menu. Select the item from the list of results. Locate and activate "check for updates" on the page if a check is not run automatically when the Windows Update interface opens. Below are direct links to cumulative updates for 32-bit and 64-bit versions of Windows 7, Windows 8.1 and Windows 10. Wow, no wonder I never look at these articles. Definitely cured for a while. > Solution: “Microsoft is working on a fix” to make it really “Only” (don’t feed the troll). Any ideas what KB4051033 is? See it listed on the page for Win 10 1607 but it’s above the current patch of KB4048953. A lot of reading again this month and not only with the update from Microsoft. Also, firms like Adobe (Shockwave and flash), Google Chrome (Yesterday) and Mozilla Firefox 57 (Quantum) are today launching there latest, so a big day today. But next to that hopefully, not only NoScript is launching there WebExtension quite soon but also it would be nice if Tabmixplus is not far from that date or even earlier. Windows Firewall stopped working at windows 10 1709 after these updates, any one has this issue? I had an issue where some UDP traffic was blocked that was needed for FailoverCluster heartbeat. I had to disable the Domain FW for the cluster to work again. Have not tried with de FW up again. In and Out rules for cluster are in place and enabled. This occured on only one of the 4 2008 R2 cluster nodes. I didn’t install kb2952664 “Compatibility update for keeping Windows up-to-date in Windows 7”, because it doesn’t seem like a security update. I am not sure what it does. Do these updates to provide telemetry? Yes. Maybe even more than just Telemetry – spyware.? From about 2014, there has been about 20+ different versions of KB2952664(Win 7) offered by M$, ie nearly every month. And once installed, it is not easy to uninstall. Why so many versions of this Win 7/8.1 update throughout the Win 10 years.? Something fishy is going on. It’s more than simply “fishy.” Microsoft is fishing for your personal data. Once they create a sufficient profile of you and your ongoing interests, they will target you for monetary gain by way of advertisements and solicitations. Oh, and what a handy crypt of info to turn over to any Federal security entity should they come a-callin’ with a demand for release, or per a compliant court order. Or maybe just to sift through by way of specialized, high-power algorithms – en masse. As it is, the Big 3 computer companies – Microsoft, Apple and Google – are slowly morphing into conduits of the NSA and the Feds in general. But not at the expense of profiting handsomely from raiding and manipulating our system caches for their own greedy purpo$e$ in the meantime. Hi Martin, you mentioned KB4041693 and KB4041691 in the “Known Issues” section, but neither of them appears anywhere else on the page; or at least CTRL+F on FF ESR 52.5.0 doesn’t find them. Which updates do they belong to? On a slightly different note, is there no security only update available for .NET Framework? You’ve only listed the “Security and Quality” version. Consequently I’m a bit concerned that installing KB4040981 could lead to a problem since the original fix wasn’t installed. Are you running Windows 10 1709 (Fall Creators Update) Steve? @ Martin, it would appear from the same blog that there isn’t a .NET Framework Security Only update this month. There was an update rollup for .NET that I installed on Windows 8 (natively a Server 2012 RTM update), but it was available for other versions of Windows. Great work again, clearing up some of the confusion created (deliberately?) by Microsoft. One addition: under “Direct update downloads” for Win 8.1, for the KB4048961 2017-11 “Security Only Update”, only the version for x86 systems is listed above. But there is a different “Security Only Update” package for x64 systems, which Microsoft (trying to add more confusion) has given the same KB number. Yeppers, since I have to manually download Server 2012 updates to apply to Windows 8 (not 8.1), I have to go through the confusion every month. There was the same .NET rollup for the last three months for v4.52. THERE’S A SHOCKER! And yup, once again, the dreaded BSOD. It seems like every update lately has this problem. And I’m sick of it. And I’m not the only one. Have to reboot in safe mode, uninstall the update, then run the Hide Updates Troubleshooter from Microsoft to keep it from installing. My PC will be forever vulnerable at this rate. Thank you very much, awesome article as usual ! @ Jody Thornton, the links you posted to Microsoft Catalog for .NET Framework patches are all for last year and beyond i.e. 2015, 2014 etc. There are no releases listed for 2017. I hope this post helps someone since i spent the entire day trying to fix it. Some Googling revealed absolutely nothing. Re-installed the printers, drivers, ports to no avail. Normal laser printers worked fine. Finally check if there any updates installed recently and there were a few for the 15th Nov 2017. Uninstalled all the system updates for that day as well as the .net updates and restarted. Low and behold they are now printing again. If anyone can shed some light on this it would be amazing. Just hoping this helps someone else not to spend the whole day searching for an issue. At least I can move forward now with the fixes. Good Lord. I have a friend who runs Windows 7 SP1 x64 and who has an Epson XP-950 printer. 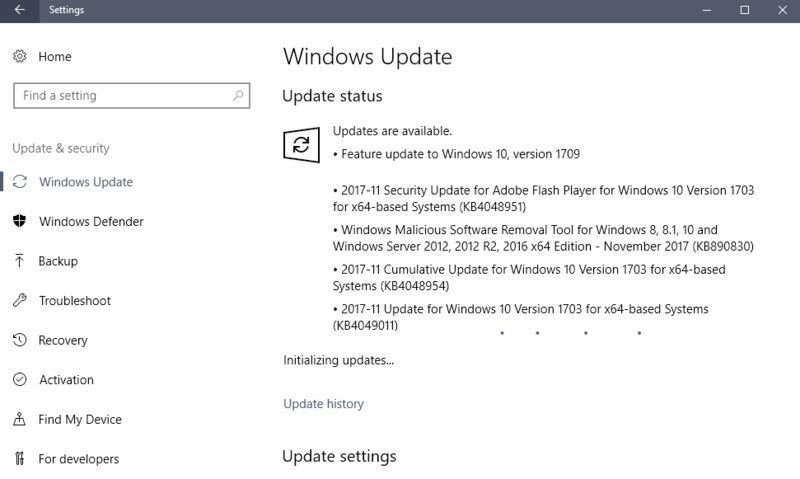 Is KB4048960 the update he has to avoid installing, or uninstall after updating? Here’s another glitch for you. Windows 7 SP1 Security-only Rollup KB4048960 ended up hosing my Windows Media Player. Specifically, WMP 12. Once the patch installed, any existing shortcut on the desktop or in the start menu I had to WMP was automatically deleted. When I then clicked on the program exe itself [located at C:\Program Files (x86)\Windows Media Player\] it relaunched the program like it is brand spanking new. All my customized settings, and all my library file links I had associated with WMP, were long gone. WTF! All I can say is — thank God for System Restore! So as it is, if I update my system with this latest Windows security patch, I lose my customized Media Player settings and my WMP library. Conversely, If I forgo the KB4048960 update to prevent this very thing, my system basically goes “unprotected”. So what now Microsoft?? If anyone ends up finding a workaround to this latest patch snafu, please post it! Everyone I know uses VLC Media Player instead of Windows Media Player, but what happened to you sounds pretty annoying. Not as annoying as the weird glitches that Microsoft updates and have inflicted on my dad’s Windows 10 computer in the past month, but still pretty annoying. He’s thinking about paying through the nose and switching to Apple, and for the first time I’m not inclined to talk him out of it. It’s more than annoying. A ton of work went into building that WMP library, which included all kinds of customized tweaks and tunings (hammering really), something that’s basically required if you want to make something of it. It’s not the easiest app to deal with I can assure you, but doable with enough patience — and persistence. Then, thanks to a not-yet-ready-for-primetime security patch, it can all be wiped out in the blink of an eye. Thank you MS. I can only imagine what your dad is going through with Win10, that metrofied monster of an OS that I’ve avoided like the plague. The problem is once you adopt it, Microsoft insists on sitting you in their one-course-for-all caboose to go along for whatever ride they choose. To hell with “customer choice” in any imaginable stripe or configuration. In Redmond’s eyes, such arcane concepts went out with the dinosaurs (aka their early user base). Microsoft + annoying. The two concepts blend almost seamlessly these days. Alas. I didn’t mean to diminish your pain, which now actually sounds worse than what my dad is going through. He can’t scan directly from his printer’s console to the Windows 10 computer. (No problem with that on Windows 7 computers.) His RealTimeSync tasks, which are scheduled to start at log-on, “start” but don’t actually run until he manually loads and then exits FreeFileSync. (No such automation-impeding nonsense on Windows 7 computers.) He now has to boot his Windows 10 computer and log on to his Windows account before docking and connecting to his external keyboard and monitor, whereas before he had to do the opposite. (That took a while to figure out, and in the meantime we were confronted with what seemed to be an undockable laptop.) The screen resolution and scaling no longer adjust automatically when he moves between the 30″ external monitor and the 14″ built-in monitor. (That’s a daily recurring hassle.) And that’s just the stuff I can remember off the top of my head. If I were you, I’d back up my entire Windows Media Player AppData folder (probably C:\Users\YourUserName\AppData\Local\Microsoft\Media Player) before attempting to install the suspect update again; install the update; start WMP to see if you have the same problem as before; if so, exit WMP for 30 seconds, copy and paste the contents of your WMP AppData backup folder into the WMP AppData folder proper; and then try again. I’m concerned, however, that wiping out all of the *.wmdb files might effectively wipe at least some of your customization work. Again, I have no experience messing around with WMP, so I don’t know what’s stored where. Windows 7 may be far from perfect, but it can’t touch the mess that W10 represents IMO. It blows my mind that this is how far things have come with MS circa 2017. I got into the Wintel world mainly to avoid the walled gardens of Apple. Now Microsoft has jumped that shark, er, wall with both feet thrust forward. I guess you could say Steve Jobs wins, from the grave. Wish I had some ideas to offer you and your pop, but the issues he’s facing actually sound worse than what I’m experiencing. I at least have system restore to fall back upon. He has only his .45 left (I wouldn’t even bother with a .22). I like your idea of exporting/importing the WMP database files. This is actually along the lines of what I was considering earlier, but have yet to enact (out of procrastination — or fear?). So I guess the time has come to give that a shot and see if it might suffice. If not, I’ll get down on my knees while rubbing a trusty cottontail and pray that my system restore doesn’t fail me this one last time. Just to be sure, and upon deeper thought, It might not hurt to cut a system image too — as you can never be too sure when it comes to Windows. Not that I have to part that pearl of wisdom to you… ha. I’m an old dog who’s reaching the point where learning new computer tricks is no longer as fun as it used to be for its own sake. I just want my computer to be a reasonably stable, reliable, and trustworthy tool that lets me get my work done and that I don’t have to watch like a hawk. But Microsoft’s post-Windows-7 moves have been enough to convince me to switch to Linux by the time Windows 7 reaches end of life. (I’ve been playing with Linux Mint Cinnamon in a virtual machine for a year and a half or so to soften the shock of the ultimate transition.) My dad’s an even older and less computer-literate dog whose department at work supports only Windows and OSX, so Linux isn’t an option for him. (In case the fact that he’s still working makes my claim to being an old dog seem questionable, I should point out that he’s a 90-year-old basic-medical-science researcher who only half-jokes that his remaining goal in life is “to die funded.” He loves his work.) As I said, he’s seriously considering switching to Apple … as most of his colleagues have already done. Shame about his Lenovo X1 Yoga with the OLED screen, though. It’s not user-serviceable, so I wouldn’t have chosen it (you can’t easily swap drives or replace the battery if/when they die), but it’s a pretty nifty little machine. It looks like we have quite a bit in common. I’m an old enough pc user myself to be considered a computing dinosaur, which equates to persona non grata in the eyes of Microsoft. By way of reference, my mother died just last year, one month shy of age 94. That should give you some idea about where I am on the longevity escalator. Couldn’t agree with you more about learning new tricks these days. That thrill is long gone; too many promises were given but left unfulfilled in the computing world, and with MS in particular. Ever since they metrofied their flagship apps with nameless, faceless blocks and ribbons, they’ve been increasingly turning me sour. Then you have their enduring smugness that they know what’s best on all things computive (sic), and that we pawns should be content to go along for whatever ride they choose for us, no questions asked. Shades of Apple, only without the gloss and quality control. Moreover, we should be content to serve their purposes, and not the other way around, while they profit madly into the bargain. At some point, Wintel’s “have it your way” credo morphed into “HAVE IT OUR WAY CHUMPS. Oh, and if you don’t like it, get a Linux or Mac!” And so, many are doing just that, or considering it for the first time. The Redmond Road, it turns out, was paved with spurious intentions. THEIRS. Like you, my wife and I have been debating what to do once Windows 7 reaches the end of the road. We’ve both become disenchanted with MS, and shake our heads at what’s become of Windows, with its newfangled enforced indenture. Hollow assurances aside, I can see the day when it will evolve into a one-shoe-fits-all subscription service. Though they assure us that won’t happen, I’ve seen too many promises broken, and exits-stage-left, from this company over the years to be convinced that inevitability remains out of bounds. But even if that somehow didn’t materialize, dealing with Windows nowadays has become more of an annoyance, indeed chore, than anything else, replete with far too many unpleasant surprises. Like I said, any thrill there was – once upon a time – is gone. * Keep an eye out for reports of major bugs on gHacks, AskWoody, and my tech headlines service. * Wait until Belarc Advisor updates its database to incorporate the latest security updates (which usually happens a day or two after Patch Tuesday). * Run Belarc Advisor and see what security updates are flagged as missing. * Run a standard Malwarebytes scan. * Run a boot-time disk check/repair on my system drive. * Clone my system drive to a second drive that I can swap in for it, in case of a major update-induced catastrophe. * Run both stages of WSUS Offline Update, with the security updates only, automatic reboot and recall, and view log options ticked. * Check the WSUS log for each stage for errors and warnings. * Run Belarc Advisor again to see if anything is still missing and investigate why (e.g., because of false positives or buggy-patch blacklisting by WSUS). * Run WPD to make sure none of Microsoft’s “security-only” patches re-opened any privacy holes. This month, everything went fine, Belarc and WPD gave me a clean bill of health, and I haven’t noticed any system problems. (There were no errors in the WSUS logs, only warnings that the Windows Update Service couldn’t be stopped or restarted, which I assume is normal, given that I had disabled the service.) I don’t use Microsoft Office, so I can’t speak to any potential problems there. Both my Nvidia Geforce 660 on one Dell computer; and my AMD Radeon R9 380 series on another Alienware computer now crash a few minutes into playing any game after the latest Windows update. When I uninstall, the games play fine. So, that tells me it’s the update….. any thoughts or solutions. I know I need the update to keep my system secure…. Gawd knows all the stuff they’re messing with behind the scenes with these “quality update” security patches. I have a hard time trusting MS anymore with anything they turn out, let alone say or do. In your case, it hardly seems like a coincidence considering it is happening on two different machines you have at your disposal. I say trust your instincts — and the evidence! Look at it this way. You could always fall back on the system restore point you set earlier if nothing you try works, or if push comes to shove – and bigger guns are called for – the drive image you created. Or google for more answers, like all lost souls do.